Leody Taveras embraces his billing as the top-ranked Texas prospect, and how he carries that distinction has really impressed his Class A Advanced Down East hitting coach Kenny Hook since he first worked with him with short-season Spokane in 2016. "He's mature beyond his years. I would say that most kids are expected to go out there and perform at this level with the lofted profile that he possesses," Hook said. "He's expected to be our No. 1 prospect and he's expected to do well and perform. And I think he carries that so well. But that's what makes him him. He doesn't really get caught up in any of that. He knows that this is a stepping stone because he's looking to improve and get to another level. That's what makes him such a joy to coach, really." Taveras flashed that pedigree Tuesday as MLB.com's No. 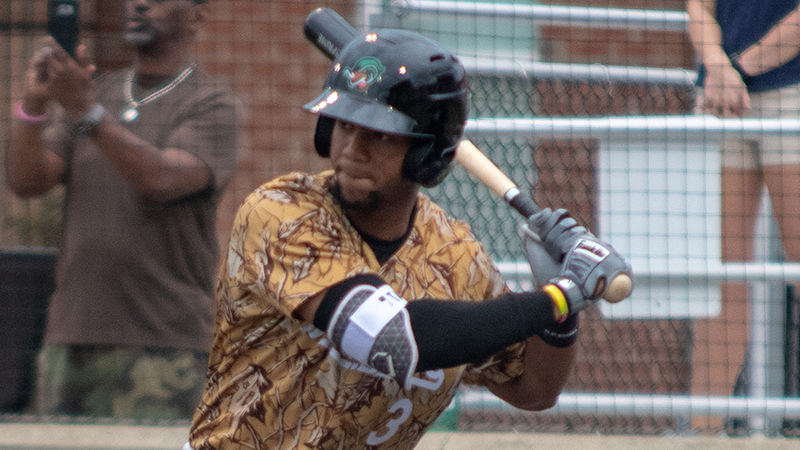 29 overall prospect finished a home run away from the cycle with two RBIs and two runs as the Wood Ducks' 8-5 win gave Down East a sweep of Tuesday's doubleheader with Wilmington at Grainger Stadium. In the opener, Taveras went 2-for-3 with an RBI and a run in the 6-5 victory. In Game 1, the 19-year-old legged out an infield single to second base in the first inning and grounded an RBI single to center in the fourth for his first multi-hit game since May 22 against Carolina. In Game 2, Taveras was even better. He grounded his 10th double of the year to left in the first, plated two runs with a triple to center in the fourth and singled on a 3-2 count to shortstop in the fifth. "He's such a graceful player that he doesn't really have to force anything, just let his hands do the work," Hook said. "The ball jumps off his bat. So to see those extra-base hits when he stays really short and smooth with his movements with his swing, he can put a ball in the gap and it's a beautiful thing to watch him run when he does it." The cousin of former Major Leaguer Willy Taveras entered Tuesday's action in a significant slump, hitting .118 without an extra-base hit and 15 strikeouts over his last 13 games. It's a result of Taveras facing more advanced pitching and trying to do too much, according to Hook. "He's a guy that it doesn't really matter what the pitch is, as long as he sticks to the area he wants it in, just because he has gifted hands and plate coverage with his swing," Hook said. "I think he just goes through stretches where he gets a little jumpy when he sees certain pitches he doesn't expect." The switch-hitting outfielder was named a Carolina League All-Star on Monday. He's hitting .255 with 10 doubles, three triples and three homers for the Wood Ducks. He batted .249/.312/.360 with Class A Hickory last year. He earned a midseason callup after playing 11 games for Texas' Dominican Summer League affiliate and went on to hit .278 with a .711 OPS in the Rookie-level Arizona League and .228 with a .563 OPS at Spokane in 2016. Taveras is the second-youngest prospect in the Carolina League, born just five days before second-ranked Cubs prospect Aramis Ademan. It's something he's dealt with at every stage of his career -- he was the youngest player in the Northwest League in 2016 and the third-youngest in the South Atlantic League in 2017, but his maturity and work ethic has allowed the Rangers to aggressively promote him. "I think that comes from having a little bit of pedigree," Hook said. "The other thing is that he wants to be great and being great comes with a lot of work. But he embraces the work. I think what we see is this humble player, you're going to see that approach and attitude when someone embraces the work and really knows what that's about. Getting caught up in the daily grind. And he enjoys it. He's always looking for ways to get better. He's in tune with what he needs to do improve and adjust to and things like that. When the focus is on those things, you're going to see someone that's really driven and I think that's where the humbleness shows up, is that he's driven to be a great player." Rangers No. 11 prospect Anderson Tejeda belted a three-run homer and drove in four runs in the opener.